There are few things I detest more than parents who judge other parents. The sense of superiority you feel in not losing it when my kid has just toppled over the (third) display in the supermarket after he has screamed for 20 minutes about not getting a cookie at the bakery and after opening the pretzels which, obliviously to you, have been sprinkled up and down the produce aisle? Well, if you are not hissing under your breath that there will be ABSOLUTELY NO SCREENTIME TONIGHT and that you are taking away the star on the “good for you!” chart and that you are Very Disappointed in their behavior? Then you obviously have never taken a child to the supermarket. Which means you either don’t have children or have very luxurious accommodations which allow you to saunter on over to pick up the weekly 72 gallons of milk without your children in tow. So back off with the contemptuous look. Offer me a hand when I am trying to check out while swiping the candy bars out of my child’s hand and balancing a 90-pound container of laundry detergent and two-ton vat of peanut butter at the same time. Or just tell me that you hope my day gets better. My top picks for reminding me that there will always be those days (also great to share if anyone in your house has a Very Bad Day). Actually, just read this one. It’s the best, and you’re probably too tired for more than one book anyway. 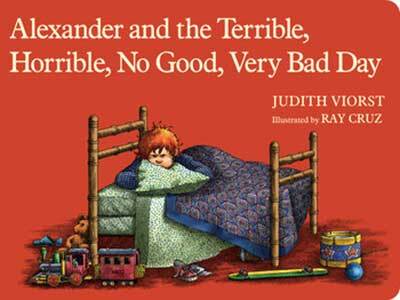 The perennially popular tale of Alexander’s worst day is now a board book that belongs on every child’s bookshelf.Alexander is not having a great day. He has to endure gum in his hair, sitting in the middle of the backseat, third-best-friend status, no dessert at lunch, lima beans, railroad pajamas, and kissing on TV—all in one day! Maybe he’ll just move to Australia. 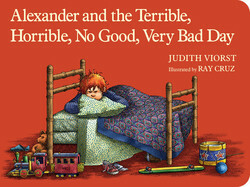 This funny and endearing story has delighted readers for more than forty years, and now it’s available as Classic Board Book with artwork that showcases Alexander—and only Alexander—in full color, underscoring the misery (and comedy) of his awful day.